Matte paper is a versatile stock and is compatible with both inkjet and laser printers due to the absence of a thick, shiny coated layer. It dries quickly and resists fingerprints. Therefore, the quality remains true and the risk of accidentally ruining the prospectus is minimal. However, the print quality may be lower than other options, such as glossy, and the colours often aren’t as sharp or vivid. Due to the lack of thick coating and a protective layer, printed products on matte paper could also be more prone to creasing and bending. Unless you use professional matte paper (as opposed to regular), your prospectus may have poor longevity. Our Verdict: Matte prints don’t have that extra glossy coated layer, so it isn’t as susceptible to glare and fingerprints. Matte doesn’t quite have the same colour boost as glossy, which is important to keep in mind, but they work pretty well for monochrome shots, vintage spreads or if you want to emphasise texture on a page. Glossy stock is just like matte prints but with a shiny coating over it. This gloss gives your work an ultra smooth finish and shine which makes it satisfying to hold and look at. Photos appear to be very impressive when printed on glossy paper, thanks to this extra coating. The colours really jump out of the paper and are visually striking. It can add the finishing professional touch to your work and really shine your institution in a brilliant light, which is the perfect impression to take away from a prospectus. Unfortunately, the glossy finish typically creates glare, which means that under certain lights, your prospectus may be hard to read. The finish also leaves the prospectus more susceptible to fingerprints which means pages that will see a lot of handling probably won’t be the best place to have intricate designs and large photo spreads. Our Verdict: Glossy stock is a great choice for colourful shots as the finish enhances the sharpness of the colours. But, it can cause glare which can make it hard to read the information. In addition, there’s the problem of fingerprints so you’ll have to think about where you’ll be placing your best images. The paper provides a textured effect which is an important factor in persuading readers to turn into potential customers. Just from holding your prospectus and browsing through, they’ll know that you’ve put a lot of effort into producing it and that you mean business too. Constellation Snow isn’t really an everyday printing paper; it’s typically considered as a high-end luxury paper. So, a lot of businesses don’t choose to produce entire publications on Constellation Snow. However, it’s great for stand out, speciality pages in your prospectus. Our Verdict: It’s perhaps a little too luxury to produce a large prospectus with but can work for specific pages that you want to truly wow your readers with. Try experimenting with Constellation Snow on the front cover of your prospectus or your success story pages to show how prestigious your organisation is. As you can probably guess by the name, this printing stock is an absolute luxury. For that reason, Lux material is typically used for brochures that showcase premium products like vintage cars, watches and hotels. Lux paper has a signature coloured core that runs through the centre of the layer of the paper. The other two layers are made up of an ultra-thick card. The top layer of the card is uncoated, which means that the best way to use the product would be to opt for a LED UV printing technique. LED UV is brilliant for achieving the best quality from your work you possibly can. It helps provide a long-standing quality that every prospectus should strive for. That way, you can get a feel of the true texture of the paper and enjoy the classic look of it too. Our Verdict: As Lux gives off a classic feel, it’s a good choice for brochures that showcase premium timepieces, cars, jewellery and venues. However, it’s a little too retro and luxury for a prospectus. If you’re not careful with how you incorporate Lux, you may give off the wrong impression about your institution. But, use it tactfully (for example, to display alumni testimonials) and you could be onto a winner. Silk stock has the flexibility to be used in so many different ways. The fibres are bound together and provide an extra strength that regular paper just can’t meet. Silk stock is usually used for a high-quality, luxury item. For example, a lot of premium advertising campaigns will use silk stock to really drive home that luxury feeling of the product. After all, there’s no point advertising something at the very high-end on a regular piece of paper, is there? It would only cheapen the look of it. The silk fibres can collaborate well with other printing fibres too. This gives you the freedom to get creative and produce something incredibly crisp and striking. Once you’ve printed on silk, the stock creates a coating that ranks somewhere in between a glossy and a matte finish. Your images will be popping from the paper, whilst your text is still clear and super easy to read. Our Verdict: Silk is a great choice for prospectuses. The stock feels more luxurious than both matte and gloss, yet isn’t as traditional-looking as Lux, it can help give off a classy and serious impression. It’ll definitely help your establishment stand out from the others. What uncoated paper lacks in terms of smooth texture, it makes up for in versatility. Although the stock may not be as pleasant to feel and read from than other options, the wide variety of finishes that you can choose from definitely outweighs this. The variety of this stock ranges from different colours, extra visual effects and you can even choose different scents for your work too. All these different varieties will definitely ensure that your prospectus stands out from the other universities. One of the reasons why uncoated stock has increased in popularity is because of the recent organic trend, which helps give off a more natural quality look. Natural products are booming because consumers love knowing that the items they’re buying aren’t going to harm the environment. Natural prints are no different. The feel of this paper is superior to others. It can often convey feelings of prestige and wealth that other printing papers lack, which is something that you should consider as you’re going to be facing up against a lot of other competitors and have your university’s reputation in your hands. 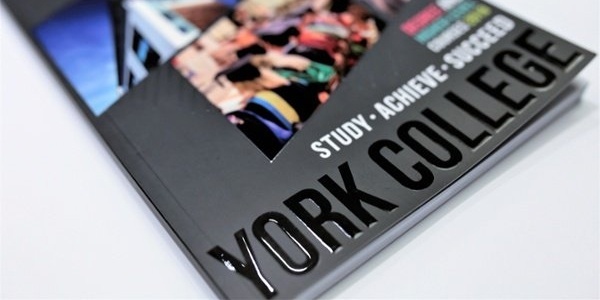 Our Verdict: If you want your prospectus to stand out, it definitely will with uncoated stock. Although it doesn’t have as smooth a texture as other options (take glossy, for example), vivid colours and sharp images will grab your potential students’ attention and the surprisingly luxurious feel will drive home the message that you’re a prestigious university that is serious about education. If you're looking for the difference between Matte and Glossy finishing, click here. B&B Press are experts in all things print, especially prospectuses. 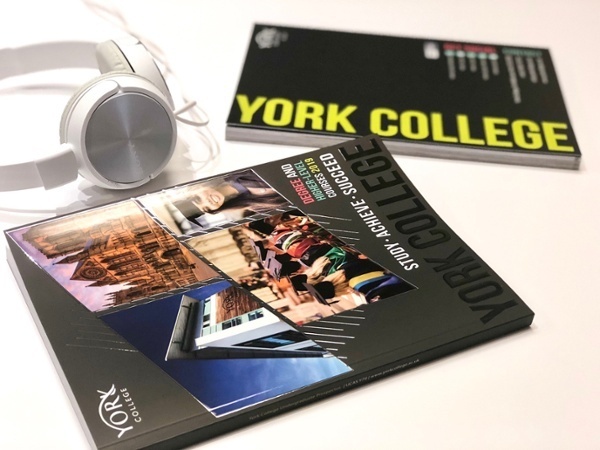 We created a brilliant prospectus for York College. We used a high shine gloss coating over the images and matte laminate on the cover. This hybrid helped to both bring the colours to life and created a striking contrast between the two types of stock, which left a lasting impression in the readers’ minds.